Though the original cars may have been compact and bijou, this year's anniversary is anything but a small affair. 15.02.2014 - It is now 50 years since one of the most spectacular victories in the history of international motor sport: in late January 1964, the Mini Cooper S won the Monte Carlo Rally for the very first time. It was the pairing of Northern Ireland’s Patrick Hopkirk and his co-driver Henry Liddon that pulled off the big surprise: with the small British car's faultless run over country roads and mountain passes, ice and snow, tight corners and steep gradients laying the foundations for the underdog-turned-giant-slayer to cement itself in both the hearts of the public and the annals of motor sport legend. It was the legendary “Night of the Long Knives”, the penultimate stage of the Monte, which put the Mini Cooper S with the now famous licence plate 33 EJB on course for victory that winter of 1964. Hopkirk crossed the finish line just 17 seconds off the pace set by his chief adversary Bo Ljungfeldt in the far more powerful V8-powered Ford Falcon. 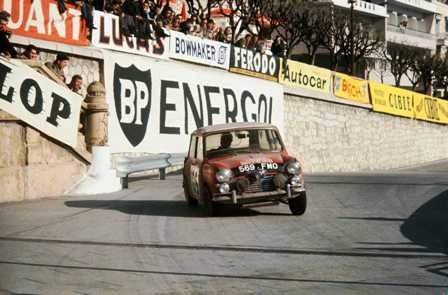 The handicap formula at the time, designed to even out the weight and power differences between the various cars, meant the classic Mini actually led the way in the overall standings, and Hopkirk defended his advantage in the sprint through the streets of Monte Carlo that rounded off the rally. The win was lauded in the small car's home country. Hopkirk even received a congratulatory telegram from the British government and the Beatles pop group, items he still holds dear to this day. Produced with news.CMS in 0,0913 seconds.